WOUNDED BIRD: DRUNK ON SOUL MUSIC? Is it possible to get drunk on music? As we rolled through Scotland in MadChauffeur's wheels, along with the chills and thrills of riding fast on one lane roads with two way traffic and "Oooh!" and "Aaah!" scenery around every curve, we had SOUL in spades. I love soul music and have done so since my teens, however, I have never listened to soul music for such a sustained period of time in my whole life. By the end of 8 days of hours of listening to the music, I was a-groovin' and a-tappin' away in the car. If there had been room, I'd have been a-dancin'. I felt drunk on SOUL. Here's a top-100 list and more of the greatest of soul and R&B recordings. I know we heard a good many of the artists and some of the songs, but as I said, I was drunk, and one tends to lose one's sense of accurate recall when enebriated, so I can't say for sure. Cathy brought along opera and classical music CDs which did not get played until MadChauffeur abandoned us at the Glenuig Inn, and we hired our car for Cathy's turn at driving. Since I also love opera and classical music, I was quite happy with the change in sound, but without the total immersion in the music for hours on end, I did not get drunk. And speaking of drunk (Did I really say that?!!! ), I developed a taste for single malt (Bruce and Caminante alert!) under the influence of the wicked Cathy. Now I'd tasted the drink before and never liked it, but this time around, I acquired a taste for it, and I blame Cathy. She made me do it. I posted the following comment at MadChauffeur's blog using Cathy's Notebook with the tiny keyboard, and thus was born Mimo, my evil Doppelgänger. Hi everyone. Mimi here from Newcastle. Johnathan has a sweet side that he doesn't reveal very often. He was quite kind an patient with me when we went shopping for the prop0er shoew for me for trekking in Scotland. He picked ouu thick socks for me qnd even noticed when the clerk at checkout was charging me too much for my shoes. He's a lovely man, you know even if he's shy aqbout letting that part of himself shop. Do you see? My Doppelgänger took over my comment, and she can neither spell nor type. Just so you'll know, I deny responsibility for anything that Mimo says. 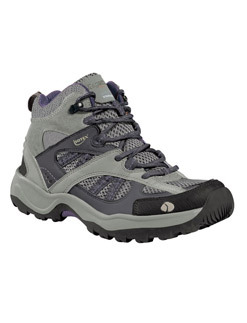 Below is a picture of the boots, which are quite comfortable and were just the thing for the oftentimes wet terrain in Scotland, having good grips on the soles along with ankle support. The boots were half-price, and the clerk at checkout was charging me full price until MadChauffeur noticed the mistake. My only caveat about the purchase is the shoelaces, which do not stay tied even with a double knot and are also too long and sometimes trail on the ground. Plus, already the tip of one lace came off, which would make it impossible to thread should the shoelaces come out. So it's new shoelaces for the boots, which, all things considered, still makes them a wise purchase. I had no room in my luggage for the boots, so the only way I could get them home without having to carry another bag was to wear them. Oh dear! I hope that my future posts on the trip will not stray so far into stream-of-consciousness mode. Once I have my 500-plus pictures uploaded and culled, I hope to be a bit more settled in my writing. Great music, Mimo! I love that grapevine song. About your shoe laces, the very reason they are long is that if the aglit gets removed at the end, you will never have to reinsert it cause it will never come out of the hole! Wonderful boots-- just right for traveling. Kristin (our daughter) even wears hers to the opera sometimes. The length I can cope with the coming untied means new shoelaces. Glad to have you and your evil twin home. The aglet! I couldn't think of the name for the thingy, so thank you, Susan. The shoelaces still must go, because of the tendency to come untied. Ann, thanks. I may have to buy a Notebook for when I go off on trips. A laptop is too much to carry, except when traveling by car, but Cathy's Notebook was small and light. Oh, and the music was great. My CDs, such as they were, were grabbed off my shelves literally less than five minutes before I left for the station. They were very much an afterthought. Next time (I'm assuming and hoping that the dreaded Mimo will return to these shores to reprise the whole experience in the next year or so), I will think harder about the playlist. PS. The post "Mimo" left on OCICBW at Newcastle is still fekking hilarious. Don't matter how many times I read it. Susan S, you're coming to the UK in July, aren't you? ... With your choir? ... Which bit of the UK are you visiting, if ya don't mind my asking? Susan, thanks for the info on creating aglets. I could try a combination of binding with thread and clear nail polish, which might work after I cut the length of the laces on one end. Cathy, I thoroughly enjoyed the change in music styles after MadChauffeur left. Each time I read my comment from OCICBW, I laugh out loud, too. PS: I hope that you two, Susan and Cathy, can get together in England. I love hiking boots - whenever I put them on, my body seems to breath a sigh of relief and say, "Oh, we're going to Jasper National Park, are we?" Tim, I'd love to hike in Jasper National Park. The pictures are gorgeous. I'll leave the single malt for after the hike. Cathy, we'll be singing for a week at Salisbury Cathedral and then go to Truro Cathedral for another week. I am laffing out loud at Mimo and her sinister message -- because truly, Mimi, if I had an evil twin, it would be bad spelling that would give her away! My evil twin and yours would no doubt get on famously. So glad you are back and starting to tell us about your trip. Susan, I used a combination of two of the methods suggested in your link. I cut off a few inches from the shoelace, bound the end of the lace with thread, and dipped the lace in glue and let it dry. Since the glue is Elmer's Liquid Glue and is not waterproof, the fix is probably not permanent. I'll buy clear fingernail polish, which should last longer, and probably cut one of the aglets and a few inches off the lace of the other boot and have a fix until I replace the shoelaces, which are 5' long. Mary Clara, I'm still laughing at Mimo's comment, too. Our evil twins would prolly get along quite well. Mimi! How could you buy boots with laces 5 feet too long? ;-) I think that you meant 5" not 5'. I couldn't resist making sure you just made a typo! Susan, the overall length of the shoelaces for the boots is 5'. That's no mistake. I cut off only a few inches - maybe 5 - of one shoelace. Sorry, I misread what you said. Geeze did they give you any reason for the laces to be that long? I've a lot of catching up to do. Week in NH with family but very spotty Internet connection. I'm a single malt lover myself, so when (not if) you come to visit Maine we'll lift a glass. A bottle lasts me a good 6 to 9 months, depending on who visits. There's no way a bottle will last you six months if you share it with Mimi, Motheramelia. More like six minutes. I'm just saying. ...when (not if) you come to visit Maine we'll lift a glass. Amelia, I'm talking up a visit to Tom. He said he missed me a lot while I was traveling, so he should come with me. We'll need to find someone to stay in the house with Diana, because she stops eating when she's away from home - now even in New Roads. Cathy, are you hitting the single malt bottle now? My friends, Cathy makes stuff up when she nips at the bottle. I'm shocked, shocked by this suggestion, Mimi. In fact I'm at work (and journalists are famous for their temperance as everyone knows). Anyway, I don't make stuff up - you just claim I do, then you admit later that all the naughtiest stuff was true! I'm at work (and journalists are famous for their temperance as everyone knows).